St. Louis Cathedral is a spectacular piece of architecture showcasing elements of Renaissance and Spanish Colonial styles. 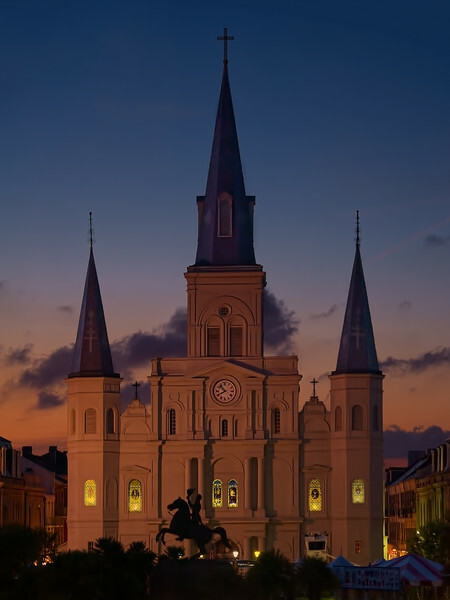 The iconic cathedral is nicely set off being flanked by the historic Cabildo building on the left side and the equally historic Presbytere on the right. The sense of history that exudes throughout the French Quarter in New Orleans is palpable and this area around Jackson Square seems almost too historic to be in America for a someone like me that grew up in Colorado. I almost felt like I was more in an old vintage European city as I wandered around enjoying the sights. NOLA is a fantastic city to visit! Image notes: I manually combined two exposures for this image, one for foreground and one for sky.